When you are hunting for wilds in extreme SE PA - even the little ones are worth a photo-op! Not to mention they a good indicator - considering how harsh an environment it is. Hope you were able to get out and enjoy the nice air temps. A good go-to fly this time of year is the nitro - pictured above. 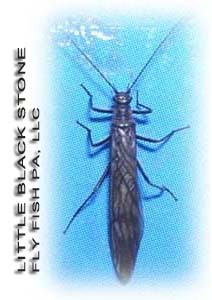 It is an effective olive emerger and is worth having in the box. 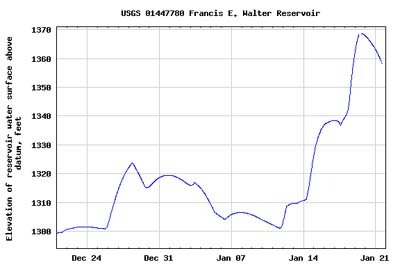 With the heavy rain we had earlier in the week, Francis E Walter once again did its job of holding back potentially flooding water. As you can see from the chart above the lake rose to about 1,370' above sea level before the Corps started to release. This evevation puts the flood control usage at about 18%. In fact if rumors are correct, we will be looking at about this much water in the lake to begin the season come April. This extra 65' or so will give the fish and the rafters more water during the upcoming summer. The more the better, but for teh fishery it really needs to be cold....we are working on that. Here we are in the heart of winter and you'd never know it! After brief bout of storms and the white stuff back around Thanksgiving and into the middle part December - we've been very mild and I we can tell that most of you out there have a bit of cabin fever - at least judging by the amount of email we've been getting inquiring about trips and where to wet a line this time of year. Although we've checked out some water here and there throughout our travels, our fishing has been pretty lack-luster. Word is there has been some sightings of little black stones during the heat of the day, and on those A-B-E limestoners, there has been a few little beatis flitting about. For those little black stones - focus on the warmer pools. Going forward here in the next few weeks - please try to look us up at the Somerset Show - Jan 27-28. We will be there with the Lehigh Coldwater Fishery Alliance - giving a presentation on, what else, the Lehigh River. This is a must see for anyone interested in learning the river as well as how we can all work together to make the river better. Then soon after the that - there will be the Francis E Walter 2006 Release Plan Workshop, whatta mouth full that is! Look for this to be held somewhere close to FEW. Just in case you are wonder - this is hosted by all the agencies who have a stake in the Lehigh... USACE, PFBC, DCNR, DRBC and is facilitated by the Wildlands Conservancy. 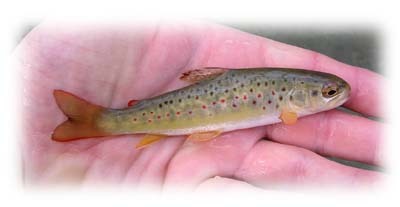 Don't forget the trout need a voice to! Look for the date of this event soon. Look for these to possibly be skittering about in the near future with this warmth. A safer-bet though is more toward the end of February. Ridley Creek actually has a decent little black stone hatch. Well, get out there while you can. A pretty heavy dose of rain looks to be on the horizon this weekend, but prior the air temps look awfully tempting! Maybe we'll see you on the water.